Set custom Time Machine intervals. Is there a better alternative to iScheduleTimeMachine? Is iScheduleTimeMachine really the best app in System category? Will iScheduleTimeMachine work good on macOS 10.13.4? 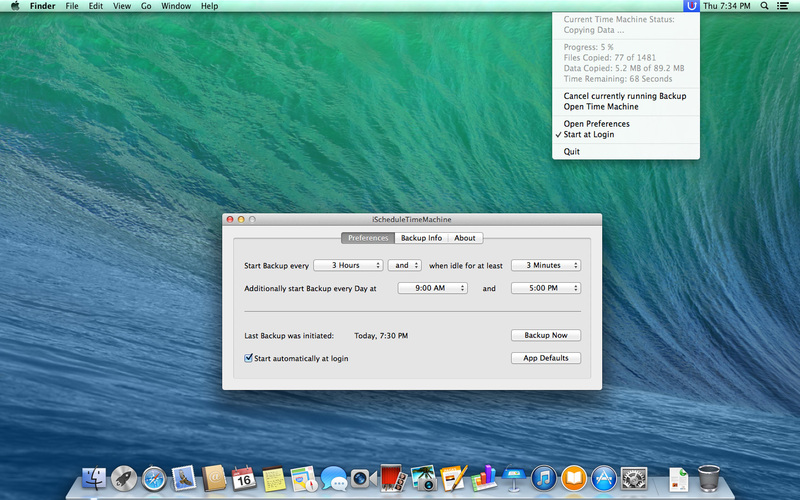 iScheduleTimeMachine is the perfect Tool to customize when you want Time Machine to backup your data. Be it based on dynamic times (every 5 minutes to every week), idle based (when you haven't worked on the computer for 1 minute to 60 minutes), or based on fixed times (for example every day at 5:00 pm). Note: The demo version available for download is 1.3a; the Mac App Store version is 1.5. Sale for a short time only! 66% discount to $0.99. optionally create backup at fixed times (for example every day at 05:00 pm just when you finish your daily work). complete replacement for Time Machine Toolbar Item. You don't need to have both items in the toolbar because iScheduleTimeMachine does all Time Machine Toolbar does and more! VERY IMPORTANT: In order for iScheduleTimeMachine to work as intended it is necessary that Time Machine is disabled in the System Settings. Otherwise the System will ALSO create backups every hour.